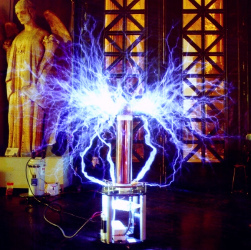 Tesla Systems Research Inc., founded in 1997 and incorporated in 2004, manufactures high-voltage electrical equipment used in educational demonstrations, special effects, and research. Our products are on display in museums and universities worldwide. During our first few years we were systematic and also fortunate to economically acquire a large inventory of specialty components and equipment. In 2001 we began selling new and used surplus electronics on Ebay. In 2006 we launched TheElectroStore.com to expand our market. We take great care to ensure customer satisfaction; as of August 2018 we have a 100% positive feedback rating of 1391 on Ebay, and have thousands of satisfied store customers.